Stewards of the environment protecting private property rights in West Puget Sound. Should I get Involved with the Kitsap Alliance? Kitsap Alliance defends property owners’ rights. Free help with building permits. On October 6, 2016, the Washington State Supreme Court ruled in the so-called “Hirst” case. The implications of this decision have the potential of eliminating all or nearly all new household or exempt wells in rural Washington. The HR2 report indicates that the Hirst decision will have exponential and far-reaching impacts in Washington state, with large effects and costs to rural communities. To read the entire report click here. Several state lawmakers are voicing their desire to overturn a state Supreme Court water-rights decision after a study released by the Building Industry Association of Washington estimated that the Hirst decision would cost the state $6.9 billion annually in lost economic activity. Former Washingon Gov. Dan Evans calls on the governor and Legislature to, finally, pass a capital budget and a fix for the state Supreme Court’s Hirst decision, which has halted development in some rural areas. It’s time for Gov. Jay Inslee, together with Republicans and Democrats in both houses of the Legislature, to put partisanship aside and solve two pressing problems. Washington state needs a capital budget and a fix to the state Supreme Court’s Hirst decision, which has impacted homebuilding in rural areas. As construction costs rise, every day that goes by without passage of the state’s capital budget means that taxpayers will pay more for building schools and other projects, and it means that needed construction is delayed. Equally important is modification of the law in response to the Hirst decision. Hirst will shatter the American dream for some Washington state families because they may not be able to obtain water on the properties they purchased unless the Legislature enacts a solution to that decision. Senator Tim Sheldon of the 35th District will be meeting with KAPO members and others for dinner starting at 5:00 PM to 7:00 PM on Aug 31, 2017 at McCloud’s, Grill House, 2901 Perry Ave. Bremerton, WA. 98310. Senator Sheldon will be sharing his thoughts on the Hirt’s Decision. (this is a fight to the finish for rural water rights). 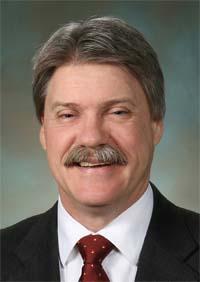 He also has his views on budgets, taxes, school funding and environmental issues of the State. There is no RSVP required. Just bring yourself and your Questions and stay for dinner. Contact Jackie at (360) 990-1088 for more information. KAPO is a nonpartisan 501 C3 organization protecting individual property rights in Kitsap County.